Relatively Retiring: What a Heel! 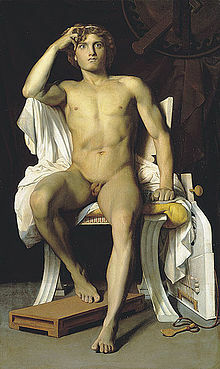 Here is Achilles, on a bad day, in a bad mood, thinking about beating up someone, famous for his volatile temper. He had a lot to be angry about, back then in Ancient Greece. Son of a nymph and a king, his fey mother held him by the heel when he was just a small baby and dipped the rest of him into the river Styx so that he would be immortal. Then, just to make sure, she anointed him with ambrosia (not the tinned rice pudding) and put him on top of a fire to burn away any mortal parts of him. Luckily she was interrupted by King Peleus, the baby's father, but she was so enraged by this that she left both father and son. King Peleus, unable or unwilling to care for his son, found a Centaur, half man, half horse to be the ideal guardian and tutor, and so it went on. Achilles, not surprisingly, also developed a raging temper and grew up to be extremely active in the Trojan Wars. Eventually he was killed by an arrow shot into the one mortal bit of him - the heel, the one bit that hadn't been dipped in the Styx. This possibly happened during battle, possibly during a tricky love affair, possibly involving poison from a specific enemy, but it was that big tendon at the back of the heel that caused the problem. Without it the foot won't work, and it is always known as the Achilles tendon, a point of vulnerability for even the strongest. Thinking about it now, it is not surprising that Achilles was vulnerable - and his poor mother, surely a bad case of post natal depression? Then the clearly inadequate father, and the totally unsuitable fostering arrangement; how could the poor lad ever be thought normal. He was a leader in the Trojan Wars, a star of the Iliad, a slayer of an Amazonian Queen (although a bit half-hearted about this one, and regretting it later), an upholder of Gay Rights, he was admired, even worshipped in antiquity and survives today in Greek philosophy and mythology. But there is still that heel, still that point of extreme vulnerability that makes him famous today, and I think he would truly hate that fact. Known more for a bit of sinew than for all those macho exploits. We all have bits of sinew holding our bones and muscles together at a practical level, and when something, some small part fails it can have a drastic effect. We all have our points of vulnerability, and I think I know mine well enough to avoid or deflect the arrows most of the time - but they still catch me out occasionally. So this is written for a son and his Achilles tendon, from a concerned mother. We all have our points of weakness. I realise there are lots of versions of Achilles' life story, but only one (or two) tendons bearing his name. How exciting! I never expected to find a naked man on RR! Keeping us on our toes you are----helped out by that handy tendon. Brilliant! These days he'd have had a social worker on his case no wonder her looks a bit glum. Probably wondering where his fig leaf went too!! Do we take it that your son has a problem with his heel? If so do hope he will recover quickly. Molly: hardly worth mentioning really, but glad to keep you interested! Marigold: he'd certainly have been in care these days, and not with a Centaur. Thank you for the good wishes - yes, a problem for a son. Tendon damage is nasty. I hope your son's pain disappears very quickly. And thank you for the reminder about poor Achilles. Ms A and Elephant's Child: many thanks for the good wishes to my son. Tendons seem take as long as bones to heal. Best wishes to him for a quick and relatively non-frustrating recovery, and thanks for the excellent post. I kept looking at the poor guy's rather strained expression. Maybe it was actually kidney stones, but the heel sounded less... personal? Hope your son gets a scooter to get around while he heals. P.Pete: oh, ha ha! Knowing your cousin, he'll be on the basketball court complete with cast (but I do hope not). Thank you for the good wishes. Thank you for the scooter suggestion, which I'll pass on! I think he's just remembered yesterday's dentist appointment. Leslee: I'm sorry about all the vulnerable parts - maybe she dipped you in the wrong river? I tell him he's not that young any more, and he certainly doesn't feel it on crutches! Isabelle: Yes, that air of confusion is very blokeish, isn't it? I hope he remembers his pants before going to the dentist. It took me a while to return to enjoyment of antiques, having written about them every week for something like fourteen years. This struck a chord. I have a son in some trouble -- if truth be told, both my sons are having some measure of difficulty -- though not of the physical sort. And you are quite right, these troubles arise because of areas of weakness in otherwise robust and competent fellows. A thought provoking post. Thank you, Anne. Every single one of us has points of weakness, and sometimes those points collapse for even the strongest of us.